A focus on the responses of police and the law to domestic violence does not meet the needs of most women and children experiencing domestic violence. 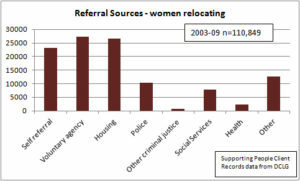 For the women who have to relocate to escape a violent partner, it is not the police that are the main source of help. Police and criminal justice agencies made up only 10% of referrals to housing related support services over six years of data (110,849 cases in England). The largest categories of referrals were from Housing authorities and providers (24%) and Voluntary Agencies (24%), and 20% were self-referrals as women contacted services directly themselves. Police referrals were even lower in London, making up just 5.2% of the referrals of London women and children to services; and Voluntary Agencies were much more important, making up over a third (35.6%) of referrals in London. So women and children need much more than legal and police responses – and they particularly need the independent non-statutory agencies of the voluntary sector, and the information and assistance that enable them to refer themselves to the kind of support services they need. Previous Previous post: Escape to the city?